This article is about the Japanese toy manufacturer. For other uses, see Bandai (disambiguation). Bandai Co., Ltd. (株式会社バンダイ, Kabushiki-gaisha Bandai) is a Japanese toy maker and a producer of a large number of plastic model kits as well as a former video game company. It was the world's third-largest producer of toys in 2008 after Mattel and Hasbro. Some ex-Bandai group companies produce anime and tokusatsu programs. Its headquarters is located in Taitō, Tokyo. In 1947, Naoharu Yamashina was working for the company of his brother-in-law, a textile wholesaler. As that segment of the market was going weak at the time, he realized about the potential of the toy industry. He successfully convinced his brother-in-law to dedicate a portion of the company's activities in that industry and to be in charge of it. Step by step, Yamashina developed a toy distribution empire within the company. On July 1950, Yamashina took full control of the toy distribution business, renamed it and founded the company Bandai-ya whose name was eventually shortened to Bandai in 1961. In its first year, Bandai produced its first internal game, the Rhythm Ball, and its first metallic toy, a reproduction of the B-26. It also began the exportation of toys. As the company expanded, Bandai increased its exportations by building up in 1953 a new warehouse outside of Komagata. Several services were created within the company such as quality control, an R&D department and a transport division. In early 1955, Bandai founded the subsidiary Waraku Works, a manufacturing facility. 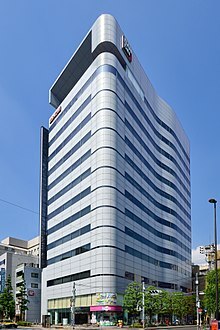 During the summer, Bandai moved to new headquarters in Taito-ku, not far from Komagata. The first company logo was created using the initials "BC" based on the first letters of Bandai Company. At the end of the year, Bandai launched its first product under guarantee, a mini replica of the Toyopet Crown car. In 1958, Bandai introduced its first television commercial using the slogan « The Red Box means a BC-guaranteed toy ». In the middle of the following year, the company launched a lineup of mini toys representing car models from all over the world dubbed as "Cars of the World". The company logo was redesigned to emphasize on the quality of Bandai's products and was known as the "Banzai mark". In the 1960s Bandai expanded to include international export sales. The management was handed to a new subsidiary created in New York called Bandai Overseas Supply. Bandai's racing car set, which first appeared in 1962, became a huge success. Bandai continued to expand in the 1970s with the creation of several subsidiaries; Tonka Japan in 1970 following a joint venture with Tonka, Bandai Models being established in 1971, and finally Popy, , who specialized in the manufacturing of toy characters. Although not their most profitable range, Bandai's 1/48 scale AFV models dominated that segment of the model kit market. Bandai America Inc. was established as local US sales/marketing operation in 1978. Spacewarp, a line of build-it-yourself toy rolling ball "roller coasters" was introduced by Bandai in the 1980s. In July 1980, Bandai launched the Gundam Plastic Model based on the animated series which gave birth to the Gunpla series. In November, the subsidiary Celent was created. In November 1985, Bandai introduced the first video game based on the manga Kinnikuman: the NES title Tag Team Match: MUSCLE, which sold more than one million copies. The management of Bandai and Sega discussed a merger in the late 1990s and voted to implement it, but the merger was later cancelled, citing "cultural differences", after a large scale protest by Bandai's middle management. Makoto Yamashina stepped down as president immediately afterwards, stating, "I feel responsible for the troubles related to the merger." After its merger with game developer and amusement facility operator Namco in 2005, Bandai Company is now under the management and a member of Bandai Namco Holdings (Bandai Namco Group). Following a group reorganisation in 2006, Bandai heads the group's Toys and Hobby Strategic Business Unit (SBU). On February 2018, Saban Brands and Bandai's US division jointly announced a mutual agreement to not renew their Power Rangers master toy license, effective Spring 2019, after which competing toy company Hasbro will inherit the license. This transition will not effect Bandai Japan's Super Sentai master toy license with Toei. A sister company, Bandai Spirits Co., Ltd, was established on February 15, 2018. On April 1, 2018, the division of Bandai Co., Ltd that dealt with products for adult customers (including figures and plastic models) as well as Banpresto's prizes business were transferred over to Bandai Spirits. In 1971, Bandai founded its subsidiary company Popy which helped to launch toylines such as Chogokin and Machine Robo. It was merged into its parent company in 1983. Bandai Visual Co. Ltd., produces and distributes many popular anime and tokusatsu titles. These titles include Cowboy Bebop, Big O, Outlaw Star, Please Teacher!, Escaflowne, and the popular Gundam, Kamen Rider, Ultraman, and Super Sentai series. Their subsidiaries include the Emotion Music Company Limited, in which the logo is the Moai, a statue found on Easter Island. They now head the Visual and Music Contents SBU. Their North American division, Bandai Visual USA was absorbed into Bandai Entertainment (also a division of Bandai Visual) on July 1, 2008. Bandai Entertainment was a subsidiary of Bandai Visual that was involved in the distribution of numerous anime in North America, as well as manga, American-made graphic novels and other merchandising ventures related to anime. Their headquarters in the United States were located in Cypress, California. They had a European subsidiary named Beez Entertainment (also a subsidiary of Bandai Visual) who handled European licensing & distribution rights to their library. The first part of Beez Entertainment's name stood for Bandai Entertainment European Zone, as Bandai Entertainment had operations in Europe. Beez Entertainment was based in France. Bandai Entertainment absorbed Bandai Visual's North American division, Bandai Visual USA, at the start of July 2008, and as a result, they were taken over by Bandai Visual, who then became their new parent company (though Bandai Entertainment continued to be part of Bandai). In addition, Bandai Visual also took over Beez Entertainment as their entry into the European market, and Beez Entertainment also continued to be part of Bandai as well. However, Bandai Entertainment is no longer acquiring licenses to new anime, and as of March 1, 2013, they are no longer distributing and publishing home video in North America except for some. Also, Beez Entertainment is no longer releasing new anime in Europe. Carddass is the Bandai subsidiary responsible for releasing trading card games based on popular Bandai franchises. This includes games such as the Gundam War Collectible Card Game based on the Gundam metaseries, as well as a Gash Bell (Zatch Bell!) TCG, Naruto CCG, Rangers Strike (Super Sentai series, Kamen Rider series, Metal Hero series), Neon Genesis Evangelion Ultra Galaxy Daikaijyu Battle (Ultra series) and most recently their most successful to date, the Battle Spirits Trading Card Game. Bandai Games produced and distributed video games based on Bandai properties including Mobile Suit Gundam: Zeonic Front, Gundam Wing: Endless Duel and Mobile Suit Gundam: Journey to Jaburo. In the early 1990s, Bandai published games for Nintendo in the United Kingdom, including Street Fighter II on the Super Nintendo Entertainment System. In the beginning of 2005, Bandai Games opened a United States office as a wholly owned subsidiary of Bandai America which, prior to that, handled the publishing of video games in North America itself. On March 31, 2006, it merged with Namco Ltd. which was renamed Bandai Namco Games Inc. In 2006, Bandai entered Super GT with Lexus SC, and won 2006 Super GT Season GT500 Class Round 3 Overall Winner and ranked on fifth place in GT500 Class. During the late 1970s, Bandai sold the TV Jack console line: a series of pong based consoles. The last of the series was the Bandai Super Vision 8000 console released in 1979. It wasn't a simple pong based console system but a cartridge system with an 8-bit NEC D780C (Z80 clone) as CPU. During the early 1980s, Bandai distributed a number of videogame machines. In 1982 the Bandai Arcadia, a variant of the Emerson Arcadia 2001, was released in Japan by Bandai. There were also four Japan-exclusive game releases which were the only known Arcadia titles written by other companies than UA Ltd. They also released local variants of the Intellivision and vectrex game consoles. Bandai produced a running mat called the Family Fun Fitness System for the Nintendo Entertainment System starting in 1986. A series of games was released both in the US and in Japan, including Athletic World and Stadium Events for the NES. Shortly after its release, Nintendo purchased the rights to the FFF mat in North America, replacing it with their own redesign, the Power Pad. In order to maintain branding continuity, Stadium Events was pulled from shelves after a short period of availability at Woolworth's stores. Because the game was pulled from shelves and discontinued before many copies were sold, Bandai's Stadium Events is universally accepted as the rarest licensed NES game released in North America. A shrinkwrapped copy of the game sold for $41,270 on eBay in February 2010. The sister game to Stadium Events, called Athletic World was initially released with a label that indicated compatibility with the Family Fun Fitness mat, but was later re-released with an updated label that mentions the Power Pad instead. Stadium Events was not released by name again, but instead was slightly modified and relaunched as the Power Pad pack-in game, World Class Track Meet. In the 1990s, Bandai teamed up with Apple to make the Pippin. They also made their own game console, the Playdia. Neither was a mass-market success. In 1999, Bandai created the WonderSwan portable game system. It, and its update, the WonderSwan Color, sold modestly well, but were unable to seriously challenge the dominant Game Boy Color and later, the Game Boy Advance. It was discontinued in 2003. Bandai has also released a series of handheld game consoles including the WonderSwan, WonderSwan Color and Swan Crystal. The systems were only released in Japan. Bandai has also released a series of LCD games including Tuttuki Bako (released in Japan in 2008) and the LCD Solarpower series (released in the 1980s in both regions). Bishōjo Senshi Sailor Moon SuperS Sailor Moon to Hiragana Lesson! Bishōjo Senshi Sailor Moon S Kondowa Puzzle de Oshioikiyo! Shōnin yo Taishi wo Idake!! ^ "Lego Celebrates 50 Years of Building". Time. 28 January 2008. Retrieved 21 September 2011. ^ "Everything Is Awesome: Lego Leaps Barbie For World's Largest Toy Maker". ^ "Bandai Group Establishes 'Bandai Channel' to Distribute Broadband Content." Bandai Group. March 4, 2004. Retrieved on March 16, 2010. ^ "BANDAI Co.,Ltd / BANDAI's History". 26 March 2009. Archived from the original on 26 March 2009. ^ "Bandai and Sega band together". Retrieved 30 December 2016. ^ "Sega, Bandai to merge into entertainment giant". 23 January 1997. Retrieved 30 December 2016 – via Japan Times Online. ^ "Acquisition of Bandai by Sega Called Off". The New York Times. 28 May 1997. Retrieved 30 December 2016. ^ Plunkett, Luke. "When Sega Wanted to Take Over the World (and Failed Miserably)". Retrieved 30 December 2016. ^ "Other Bandai Happenings". Electronic Gaming Monthly. No. 97. Ziff Davis. August 1997. p. 18. ^ "File Not Found - BANDAI NAMCO Holdings Inc". Archived from the original on 29 May 2010. Retrieved 30 December 2016. ^ "Bandai Entertainment to Stop Releasing New DVDs, BDs, Manga". Anime News Network. 2012-01-02. Retrieved 2012-01-02. ^ "Bandai Entertainment to Discontinue Home Video, Manga, Novel Sales". Anime News Network. Retrieved 31 August 2012. ^ "France's Beez Entertainment Stops Releasing New Anime". Anime News Network. ^ "N-Force Magazine Issue 06". Retrieved 30 December 2016. ^ "Original Nintendo Stadium Events Cartridge | Rare Video Games Auctions, Sales & Pricing". Gamesniped.com. 2008-05-30. Retrieved 2012-08-13. ^ "Wii Feature: 25 rarest Nintendo games ever". ComputerAndVideoGames.com. 2008-06-29. Retrieved 2012-08-13. ^ Mike Smith. "Rare Nintendo game is $40,000 windfall". ^ "Variant labels for NES games [Archive] - Retrogaming Roundtable". Digitpress.com. 2007-10-18. Retrieved 2012-08-13. ^ "Missile Invader by Bandai from Retrogames". www.retrogames.co.uk. Retrieved 23 March 2019. ^ * Dig Dug II box art, also see Moby Games entry. Wikimedia Commons has media related to Bandai.